Awe-inspiring Neelkanth Mountain Range-above Badrinath-Himalayas. Neelkanth Mountain at 6507meters is the source of the sacred Alakananda River coming from the glacier snouts of Bhagirathi – Kharak – and Satopanth glaciers nestled there. This Alakananda River is known as the holy Rishi Ganga by the time it comes down to base camp of Neelkanth Mountain at 4270 mts and 14,000ft. It was here that this freezing holy bath in the Rishi Ganga was taken by Author. 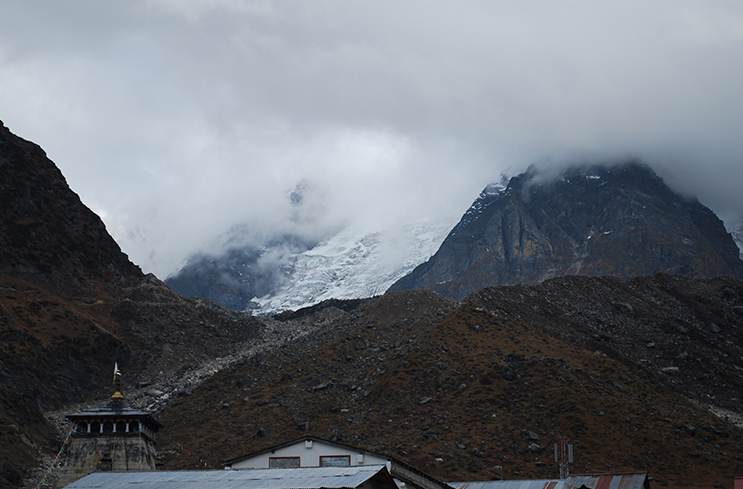 As you can see in the background, from its base camp at 4270 mts. one can get a close view of Mt Neelkanth, a major peak of the Garhwal Himalaya, standing at 6507meters. Right after taking this very rare, holy bath, (as regular visitors to Badrinath don’t normally attempt this climb), when Author came to the open area where her guide and staff member were waiting, two holy ascetics who were roaming in the area looking for special healing herbs, had very kindly lit a small fire to offer some warmth to her shivering body. Mt. Neelkanth is a pyramid-shaped peak that is popularly known as the 'Garhwal Queen'. This snow-clad mountain peak rising just above the Badrinath Temple is indeed one of the most stunning summits in the Garhwal Himalaya. A handful of successful ascents have been reported on top of Mt. Neelkanth, and the first climb from its western ridge was attempted in 1993 by two British Climbers.